"The Savery - Des Moines, Iowa - C. 1960. " (1850) POSTCARD: The Savery - Des Moines, Iowa - C. 1960. -Condition: Very Good. - Has Not been Posted. Picture of Hotel with 2nd picture of addition. Note written on back has date of stay. 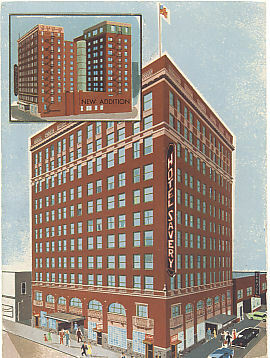 The Savery Hotel (1919) at 401 Locust Street in Des Moines, Iowa. Added to the National Register of Historic Places in 1998. Price: $3.00 + shipping.